In this research, the processing and characterization of (Y1−xPrx)1+δBa2−δCu3O7−y cuprate perovskite powder were studied. The experimental powder samples of (Y1−xPrx)1+δBa2−δCu3O7−y (0 ≤ x ≤ 1) were prepared using a conventional solid-state reaction method. 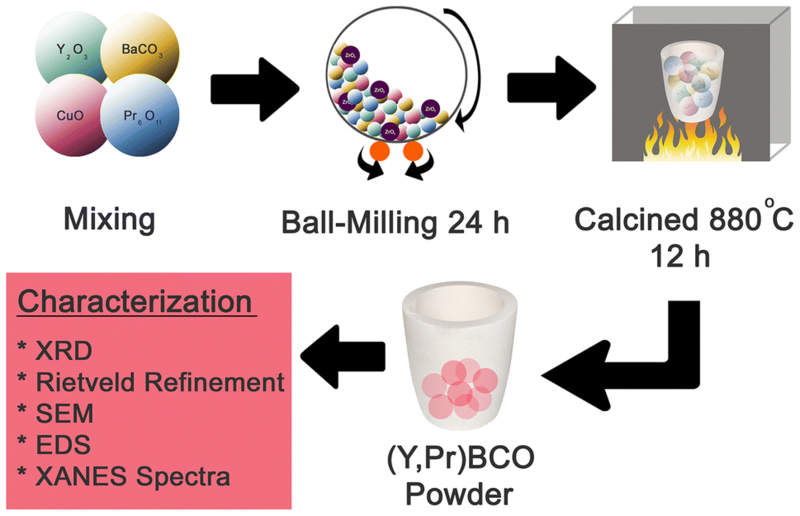 The starting powders in appropriate ratios were mixed with 6 mol% excess of A-site ions to reduce the amount of BaCuO2 and PrBaO3 second phases and calcined at 880 °C for 12 h in normal atmosphere. The calcined powders were investigated for phase content using X-ray diffraction technique and detailed structural parameters were obtained by Rietveld refinement. The microstructure of the powders was investigated by scanning electron microscopy (SEM). The chemical composition was carried out by energy dispersive X-ray analysis (EDS). The oxidation state and coordination of Pr and Cu were determined by X-ray absorption near edge structure (XANES) spectroscopy. It was found that high-purity (Y,Pr)BCO powders could be obtained. By the Rietveld refinement, the overall unit cell volume increased with increasing Pr content. SEM–EDS images showed that the particle size was about 1–5 μm and the elemental composition of (Y + Pr):Ba:Cu = 1:2:3. Pr and Cu XANES spectra indicated that the average formal valence was larger than 3 for Pr and 2 for Cu. However, the peak shifted to lower valence state at higher concentration of Pr. This research was financially supported by the Thailand Research Fund, the Physics and Astronomy Research Center, and TA/RA (2560–2561) scholarships, Graduate School, Chiang Mai University. 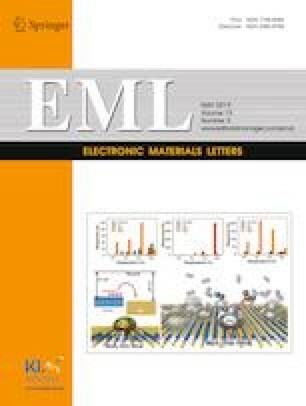 Partial supports from the Center of Excellence in Advanced Materials for Printed Electronics and Sensors (CMU-NECTEC), Center of Excellence in Materials Science and Technology, Faculty of Science, the Graduate School, Chiang Mai University, and Takpittayakhom School are also acknowledged. Authors would also like to thank Beamline 8 (BL8) Staff at Synchrotron Light Research Institute (SLRI) for XANES measurement. P. Prayoonphokkharat would also like to thank the financial support from the TRF through the Royal Golden Jubilee Ph.D. Program (PhD 0106/2560).